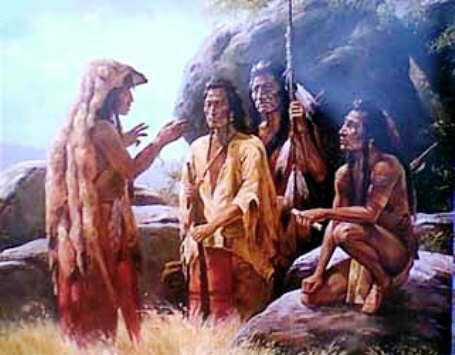 Once upon a time there was an old Indian who had an only son, whose name was Opeechee. The boy had come to the age when every Indian lad makes a fast, in order to secure a Spirit to be his guardian for life. The boy did carefully all that his father commanded, and lay quietly with his face covered, awaiting the arrival of his guardian Spirit who was to bring him good or bad dreams. His father visited him every day, encouraging him to endure with patience the pangs of hunger and thirst. He told him of the honour and renown that would be his if he continued his fast to the end of the twelve days. "My Son," replied the old man, "you know not what you ask. If you get up now, all your glory will depart. Wait patiently a little longer. You have but three days more to fast, then glory and honour will be yours." "My father has destroyed my fortune as a man. He would not listen to my requests. I shall be happy forever because I was obedient to my parent; but he will suffer. My guardian Spirit has given me a new form, and now I must go!" At this his father rushed into the lodge, crying: "My Son! my Son! I pray you leave me not!" Then Opeechee the Robin stretched himself as if delighting in his new wings, and carolling his sweetest song, he flew away to the near-by trees.